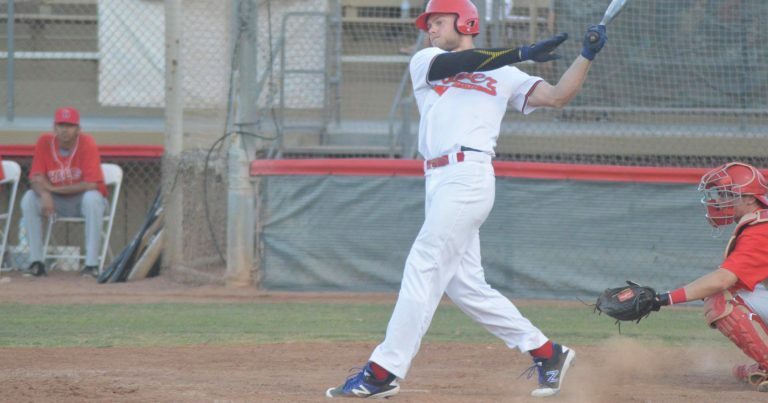 PALM SPRINGS, Calif. ~ For the second straight game, the POWER supplied more than enough offense to get by the SoCal Halos, 17-7, to complete a two-game series sweep to start the season. The POWER trailed going into their first at-bat after the Halos plated two runs in the first inning. The POWER would gain the lead with three of their own in the bottom half of the inning, and never looked back. Zack Novis (St. Mary’s) gets the win (1-0) for the Power, while the Halos’ Miles Tsiojimoto (Laverne University) takes the loss. On offense, centerfielder John Mauldin (Univ. New Orleans) returned to 2017 form after a tough opening night. He finished the game 4-5 with a double, triple and a walk. Mauldin drove in fourrunners and fell just a home run shy of the cycle. First baseman Matt Green (St. Mary’s) followed his two-hit opening night with four more hits, including three doubles, and drove in five POWER runs. Local product second baseman Josh Hernandez (College of the Desert) had another nice game going 2-4 at the dish, both for extra bases, and scored three runs. The POWER will be in action again tomorrow when Dovetail Baseball comes to Palm Springs Stadium, with first pitch at 7:05 PM. Tomorrow night is Pride Night brought to you by Chill Bar! Gates open at 6 PM.